One of the concerns with stucco exteriors is whether or not they can stand up to snow and the continually damp winter weather. 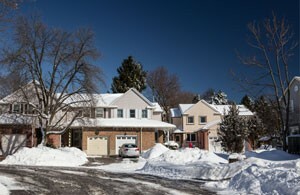 With the constant freeze-thaw cycles that most of Ontario and Canada are subjected to, there is a risk of cracking and water penetration with any exterior finish. With the right application and precautions, however, stucco performs well even in the most extreme weather. 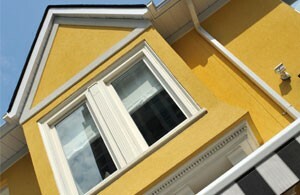 As a result, architects, builders and homeowners now prefer a stucco finish. Traditional stucco is a popular choice in warm and dry climates. Improvements in synthetic stucco (EIFS) have significantly enhanced water resistance allowing property owners in colder regions such as Ontario to enjoy the beauty and durability of this product. Here are some additional precautions you can take to protect your investment. Keep it away from the ground: If you are still concerned about wetness, you can opt for a masonry finish at the bottom of your house and apply stucco for the higher levels. That way, it won’t be sitting in the melted snow or rain water. Ensure the moisture-control layer is appropriate for your region: Stucco is made of many layers. The air and moisture barrier that is added to the substrate is the most critical. Check with your contractor or manufacturer about what barrier is appropriate for your region as well as if there are any specific assembly or installation requirements. Consider EIFS; it drains moisture: Exterior Insulation Finish Systems (EIFS) contain a moisture barrier and can help drain any water that might be caught between the layers. Plus, they provide extra insulation and R-value to reduce heat loss in the winter. This might be a smarter option for you over traditional stucco. Exterior walls with stucco finishes are fire resistant and also less susceptible to pest infiltration, rot, mould and allergens when compared to other applications. This helps create a comfortable indoor environment with improved air quality. The installers at Platinum Stucco have sound knowledge of building envelope engineering and can help advise you on custom solutions to increase energy efficiency and protect your exterior walls. To learn more about EIFS for your Canadian home, call Platinum Stucco (416) 731-8600 or request an estimate online. You can also visit our store to see the high quality products we have and talk to our team.